The real causes for much of such failures might be traced back in our inability to grasp the depth of human sufferings that war always brings. And as long as we continue ignoring the fathom of that depth, turning swords into ploughshares will always remain a deferred dream, elusive ever for us to reach anywhere closer. And here, once again, memory can play a very important role; a role that would help us, at least in real terms, to grasp the depth of tragedy that war might bring at a time when our destructive capabilities by far supersede anything that we can think about. 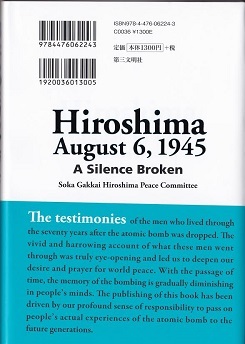 And it is precisely from this understanding that the fourteen survivors of Hiroshima atomic bombing in August 6, 1945, make a heroic contribution by knocking at our conscience through the recollection and recounting of memories of their innocent adolescent years, which were torn apart by the hellfire unleashed on that fateful morning.